Can a government be democratically elected when it carries out acts of political terror? About Ethiopia, the USDS stated in its 2015 report, “Other human rights problems included alleged arbitrary killings; alleged torture, beating, abuse, and mistreatment of detainees by security forces…” This use of terror by government security forces and the Ethiopian People’s Revolutionary Democratic Front (EPRDF)—which has governed Ethiopia for more than two decades—is not new and has been reported every year since the EPRDF took power, by independent human rights organisations including Amnesty International, Human Rights Watch, and Ethiopia Human Rights Council, as well as the United States Department of State. Are these acts of political terror (defined as such by the Political Terror Scale) included in the history President Obama is mindful of? The imprisonment and intimidation of journalists, restrictions on NGO activities, interference with peaceful opposition party activities, and government actions to restrict political space in the lead-up to election day are inconsistent with these democratic processes and norms. U.S. National Security Advisor Susan Rice didn’t believe a democratically elected government could earn all the seats in parliament. She laughed at the idea. At a July 22nd White House Press Briefing a journalist asked Rice if President Obama considered the leaders of Kenya and Ethiopia to be democratically elected. 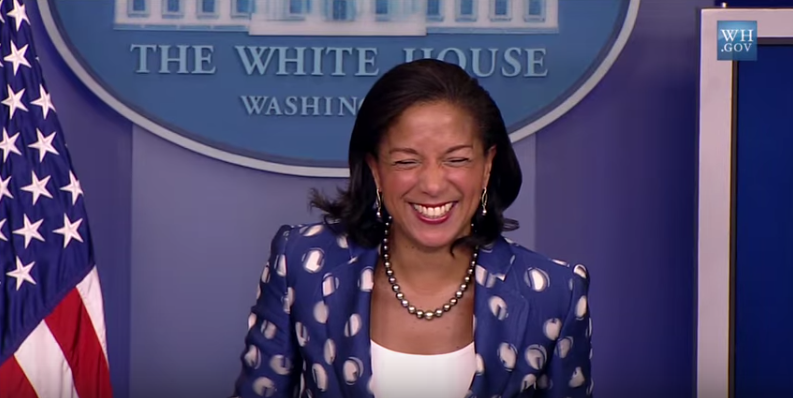 Rice responded, “…the prime minister of Ethiopia was just elected with a hundred percent of the vote which I think suggests…some concern for the integrity of the electoral process.” When the journalist inquired again if Obama considered the election democratic, Rice answered, “100 percent” and started to giggle. Just a few days after Rice’s comments, President Obama told the world Ethiopia’s government had been democratically elected. Susan Rice giggles at a July 22 White House Press briefing, after responding to a reporter’s question. Screen capture from White House video. But what’s a president to do when his nation’s closest regional ally in the so-called “war on terror” violates its own citizens’ human rights and fails to uphold the standards of democracy (and its prime minister is standing next to him at a press conference)? Does he make a statement he doesn’t believe to justify his government’s support of that regime? Does he attempt to maintain the relationship at any cost? If that cost is borne by the very people he claims to be helping with foreign aid, does it matter? If he breaks the hearts of nearly 100 million people when he tells them, and the world, that the violations of their human rights and the oppression that causes them great hardship is acceptable, is that okay? If the “war on terror” included the terror Ethiopians are subjected to at the hands of their own government, could Obama still have made that statement? And in Ethiopia, he did it with just eight words. What if we could harness the rage against injustice, to help human victims? What is the Ethiopian people who are in the know doing to help the electrorate to choose wisely and demand for their rights. If one puts their vote for the wrong person, they are individually responsible for their choice. Knowledge is power, let us give our people that to arrive at the destination we desire. Mary, I agree that knowledge is required for “the electorate to choose wisely and demand for their rights,” as you state. However, one of the issues is that information is restricted in Ethiopia, as voices that criticise the government are silenced (journalists, bloggers, critics, and opposition members are often imprisoned, or self-censor to avoid imprisonment). Another factor making it difficult for Ethiopians to demand their rights is the history of violent response by government forces to non-violent protests—as occurred when the public protested the outcome of the 2005 general election, and at least 193 protestors were killed and 20,000 people were arrested. You said that if someone votes for the wrong person, they are responsible for their choice. What if the ruling party intimidates or threatens voters? What if citizens cast their vote out of duress? What if they know they will be unable to acquire the seeds and fertilizer they need for farming, or the employment they need to provide for their families, unless they support Ethiopia’s ruling party? In its 2010 report, Development Without Freedom, Human Rights Watch describes this kind of discrimination, intimidation, and repression in Ethiopia. Even if voters overcome intimidation and fear, and cast their vote for the person they feel is right, there are no guarantees their vote will be accounted for or accepted. Without adequate election monitoring it is difficult to really know who the legitimate winner is. Mary, I agree that the Ethiopian people need help to demand their rights and elect a government that will represent them, and respect their rights. Due to repression making it difficult for change to happen from within, there are opportunities for the international community—especially nations that support Ethiopia with foreign aid—to attempt to exert some influence to improve the situation. Unfortunately, this has not happened as Ethiopia’s bilateral foreign aid donors appear more concerned with maintaining the geostrategic relationship they have with the Ethiopian government than they are about promoting human rights and democracy in Ethiopia. Thank you for your comment on my blog, Mary. I appreciate your feedback. Then they closed the partially opened political space and start winning each elections 100%. Thank you for your comment, Tolla! I appreciate you pointing out how the success of opposition candidates in 2005 has negatively impacted democratisation (and press freedom) in Ethiopia today. Reblogged this on Unity in Diversity. I followed this discussion with great interest because Ethiopia today is very much like Kenya, where I came from, about 13 years ago. Much suppression, unfair elections, and so forth. I totally understand where Al is coming from, as the most powerful leader in the world had a moment to take a clear stand on a very sensitive issue. However, on the other hand, I also understand where the US leader is coming from. As a true African himself, he put diplomacy first. As a leader, he followed the rules of international relations, safeguarding the diplomatic relations between the US and Ethiopia, as well as respecting Ethiopia as a sovereign state. If, on the other hand, the Ethiopian people took matters into their own hands, and appealed for US intervention, then that would be a different matter. I believe that Mr. Obama’s hands were tied in this instance, and we must not be too quick to judge him. Thank you, Jael Oyieke, for offering your thoughts on this issue. I appreciate reading the perspective of someone who has lived in the region. I do acknowledge that the position Obama was in during the press conference was not an easy one, but I think he could have left out those eight words about the Ethiopian government being democratically elected (when his own government has expressed doubt about whether the election was democratic), and still answered the journalist’s question diplomatically. I have been interviewed several times on television and radio, and I have also fielded impromptu questions from audiences. Occasionally I say things that I later wish I had worded differently, because I was not able to think about my reply before-hand. Perhaps that’s what happened in this press conference, although I would hope that a leader of Obama’s stature would have been well-prepared for the question on human rights that he would obviously have been asked in Ethiopia. This may be a case of a high profile leader just being “human” and making a mistake. (And he may have regretted the statement afterwards.) Whatever the explanation for Obama’s comment, I think it illustrates the power of words. Its a tight balance to walk when you’re giving a speech. First, he have to remember who his audience is, and how he has to put things. I’m surprised he wasn’t chased off stage for mentioning gay marriage in Kenya.